The municipality of Bruges (116,982 inhabitants; 13,840 ha) was established in 1970 as the merger of the former municipalities of Bruges, Assebroek (in Brugs dialect, Assebroeke), Dudzele (Dizzêle), Koolkerke (Kôolkerke), Lissewege, Sint-Andries, Sint-Kruis (Sinte-Kruus) and Sint-Michiels (Sinte-Machiels). The name of Bruges comes from old Icelandic Brucciam, meaning "a pier". Mentioned for the first time in a text dated 892, Bruges was then an earthen fortress built between the two arms of river Reie by Count Baldwin I of Flanders against the Norseman invaders. Once the Norsemen were expelled from the area, the town developed and the Count attracted merchants. In the 11th and 12th centuries, the high tides of the North Sea could reach the town. From 1180 onwards, the sea opened the New Zwin channel and reached the town later called Damme. The Count of Flanders built there the first lock in Europe. Bruges was linked to Damme by a canal diverted from the Reie. Goods were transshiped to Damme, and later to Sluis, located on the Zwin (today in the Netherlands). Bruges was the last sea port used by the Hanseatic League before sailing on the English Channel, and was also the outcome of the coasters coming from La Rochelle and Bordeaux (France). The main meeting point for the merchant fleets from northern and southern Europe, the town developed rapidly and was enclosed in stone walls. From 1127 to 1300, the intra muros area increased from 86 to 460 hectares. In the 12th and 13th centuries, the merchants and clothiers of Bruges constituted guilds and traded at the fairs of London and Champagne. In the 12th century, Bruges was the starting and ending point of the land road linking London to Cologne, via the Duchies of Brabant and Limburg, and the Holy Roman Empire. Genoese ships moored in the port of Bruges for the first time in 1277, followed by ships from Venice and Eastern Spain. The merchants prefered to use the sea road because King of France Philip the Handsome had annexed Champagne. The ships brought alum, silk, strains and spices. Italian moneychangers, then the bankers of the Holy See, set up in the house of the Van der Buerze family the first stock exchange (in Dutch, beurs; in French bourse) in Europe. The magistrat (Mayor) and the échevins (Municipal Councillors) of Bruges, in permanent struggle against the Count of Flanders and his suzereign, the King of France, were progressively awarded legal and financial rights. In 1302, the Flemish uprising against Philip the Handsome was mostly funded by the merchants of Bruges. In the 14th and 15th centuries, Bruges fought a fratricidal war against the town of Ghent. The main beneficiaries of the increasing insecurity were the prince (the Duke of Burgundy from 1384 to 1482 and then the Habsburgs) and the English cloth industry. In the 15th century, real-estate speculation by the rich abbeys and merchants caused the silting of the Zwin, as stressed in 1470 in an official report. In 1484, Bruges revolted against Maximilian of Habsburg, who was jailed for a while in the town. Bruges lost all its privileges and the foreign merchants moved to Antwerp. The town had then 35,000 inhabitants but started to decline. Bruges missed the developemnt of trading capitalism in the 16th century and of industrial capitalism in the 19th century. No industry developed either in the 20th century, so that the town was nicknamed "Bruges-la-Morte" (Bruges-the-Dead) by the Symbolist writer Georges Rodenbach(1855-1898), who published the novel of the same name in 1892. At the end of the 19th century, King Léopold II opened the Baudouin Canal between Bruges and Zeebrugge, achieving a project already imagined by Napoléon. During the First World War, the Germans used Zeebrugge as a port of call for their submarines; the English sunk ships loaded with cement in April 1918 in order to block the port. During the Second World War, Zeebrugge, bombed by the allied air forces, was completely destroyed by the Germans in 1944. The port was fully revamped and new basins were opened in 1960 because of the increasing car-ferry traffic with England. In the 1970s, the port was increased in spite of the opposition of Antwerp and Ghent. Zeebrugge is today the terminal of the gas pipeline (Zeepipe) delivering Norwegian gas to Western Europe. More than 11,000 ships moor each year in Zeebrugge, which is among the 20 most importants ports in the world. Bruges is mostly renowned for its civil architectural heritage: belfry and market (c. 1300), town hall (1376), civil clerk's office (1537), justice court (1727), St. John's hospital (rooms, 13-14th centuries); and its religious architectural heritage: Our Lady Church (in Scheldtian Gothic style, 13-14th centuries, showing a Madonna by Michelangelo and the tombs of Mary of Burgundy and Charles the Bold), St. Savior Cathedral (16th century), St. Ann church (12th century), St. Walburgius church (in Jesuit style, 1642) and the Beguine convent (17-18th centuries). The flag of Bruges (photo, photo) is rectangular, horizontally divided into eight white-red-white-red-white-red-white-red stripes with a blue lion in the center. The lion has a yellow crown, a necklace with a small yellow cross, and red claws. 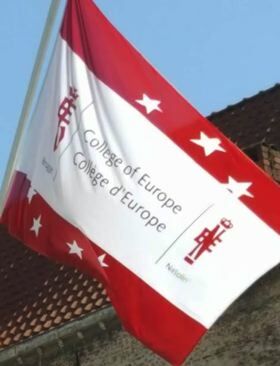 The flag is also used, unofficially, in a square version (photo). According to Gemeentewapens in België - Vlaanderen en Brussel [w2v02], the flag, adopted on 26 October 1982 by the Municipal Council, is prescribed by a Decree adopted on 1 July 1986 by the Executive of Flanders and published on 3 December 1987 in the Belgian official gazette. The flag is a banner of the municipal arms, which were granted on 20 October 1819 by (Dutch) Royal Decree and confirmed on 26 February 1842 by (Belgian) Royal Decree. The oldest known seal of Bruges, dated from 1199, shows a fortress and some fleurs-de-lis. A second seal shows a similar composition. The arms first appeared on a third seal, known since the late 13th century. The seal still shows a fortress or city gate, but in the base of the seal is a small shield with the bars and lion. In the seal from 1289 the number of bars was increased form six to eight. The meaning of the bars, however is not known. The arms were first officially granted by the Count of Flanders in 1304. The lion is most likely derived from the Flemish lion, shown in blue instead of black. The colours of the arms have been known since the 14th century. Nouveau Larousse Illustré, Dictionnaire Universel Encyclopédique (7 volumes, published in Paris, 1898-1904) [f9rXXa] shows the flags of the main Belgian towns, then based on the traditional colors of the towns. 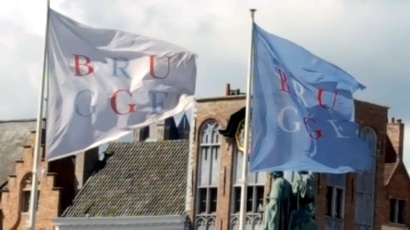 Two flags are shown for Bruges, both horizontally divided red-white-blue but differing by the proportions of the stripes, 1:6:1 and 1:1:1, respectively. 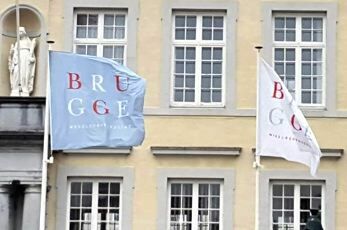 In both the town center and burg of Bruges, there are numerous flags, including those of the town of Bruges, West Flanders (both traditional and logo), Belgium, the EU, and a series of town logo flags. The flags are very large, and are square. There are three background colors white; light gray, light blue). Some have only "Brugge," and some have the additional text "Werelderfgoedstad" (World Heritage City) at the bottom, so there are six variations in all.